Handkerchieves hold fascination for our GriggsDakota recent bride. Nearly anything with a bit of history, particularly family history, gets her attention. So handkerchieves were used to wrap the stems of her bridal bouquets. They added a great bit of color in an unexpected spot. Every hankie was different, but in the color scheme of the wedding which made the bouquets distinctive. The hankie was a nice memento of the day long after the flowers had faded. A white linen and lace hankie gave the bride a traditional touch in difficult moments. And was there to comfort her sweaty palm when she heard her music cued. 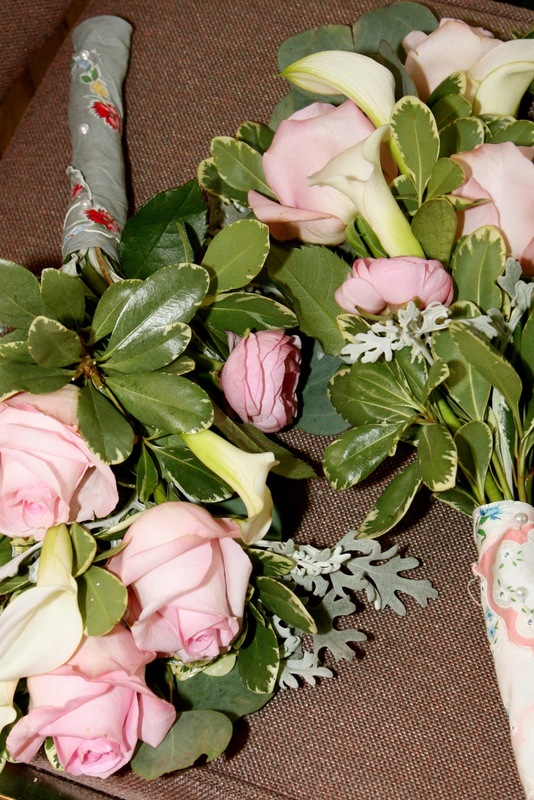 The handkerchieves were artfully wrapped around the flower stems and held in place with pearl head pins. And the bride thought everything was perfect. photo credit: Dr. Keith Millette, Godfather of the bride. I used my grandmas lace hanky to wrap my bouquet. I also wanted to use them for save-the-dates. I totally would have if we would have gotten married in the spring!